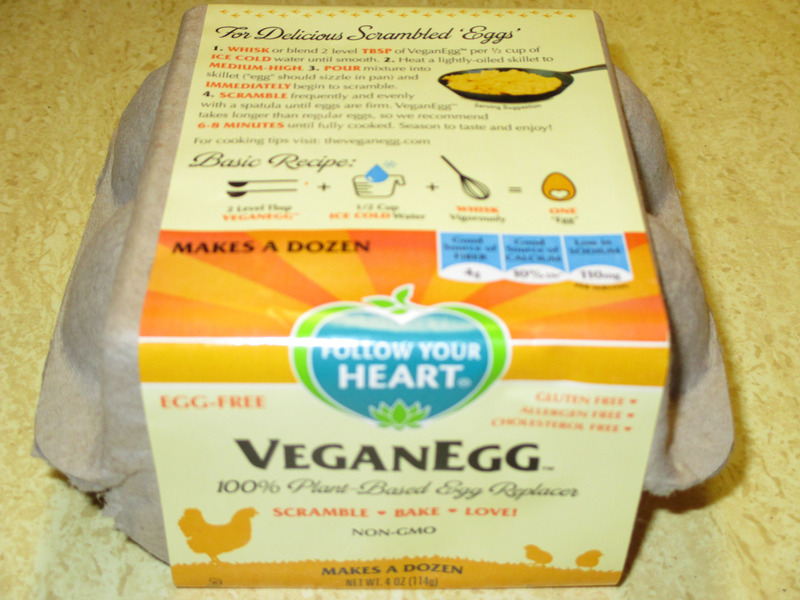 By far one of the biggest vegan news topics of 2015 was the release of VeganEgg by Follow Your Heart (best known as makers of the utterly amazing Vegenaise). 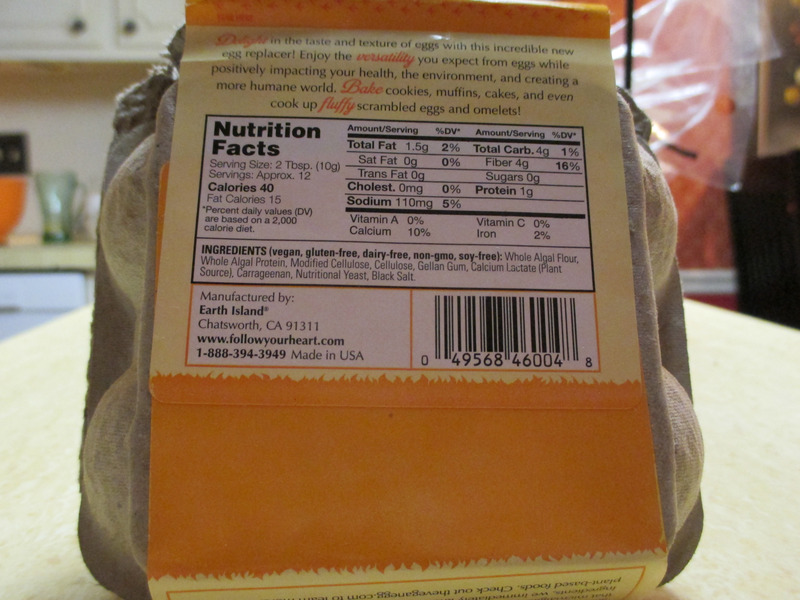 More than 10 years in the making, VeganEgg was the first “whole-egg” alternative to hit the market – useful not just in baking (a la Ener-G Egg Replacer) or imparting an egglike taste and texture to tofu scrambles and French toast (a la the venerable The Vegg), but actually replicating the texture and flavor in scrambled eggs and omelets. As if that wasn’t amazing enough, VeganEgg is also non-GMO, cholesterol-free, and has about half the fat and calories of a chicken egg. It’s free of the most common allergens (egg, dairy, soy, nuts, gluten). It’s cruelty-free and also environmentally friendly and sustainable. ONE HUNDRED VeganEggs can be made with the water used to produce just ONE chicken egg! Originally available just online (Amazon and Vegan Essentials), the VeganEgg has been slowly filtering into specialty stores and will be more widely available in the near future. In Charlotte, NC you can find the VeganEgg at The Market @ Bean Vegan Cuisine (inside the restaurant at 3001 East Independence Boulevard, Charlotte, North Carolina 28205) and The Greener Apple (inside Book Buyers, 1306 The Plaza, Charlotte, NC 28205). My partner and I purchased our initial VeganEggs from The Market @ Bean Vegan Cuisine for $8.15 ($7.99 + $.16 grocery tax). Inside, though, you find a bag of white powder. I was slightly disappointed in this, even though I could see the practicality. 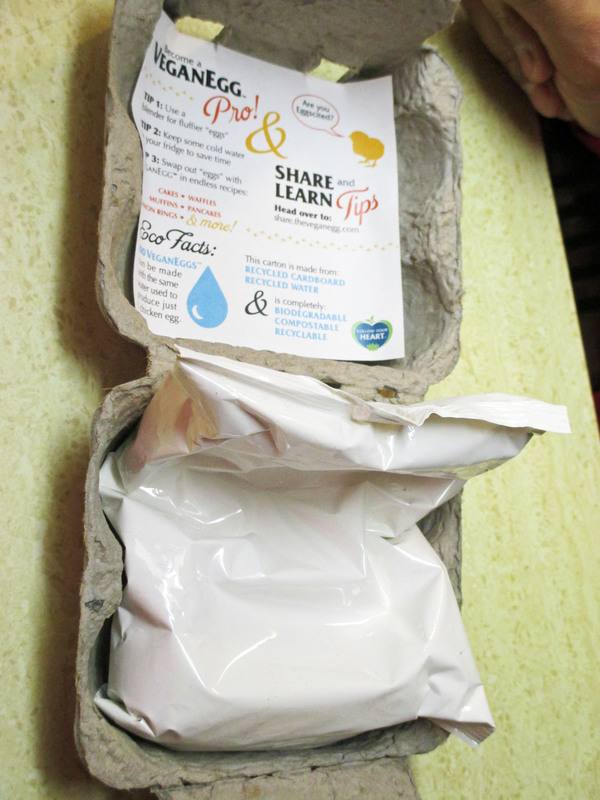 With the cute egg-carton container, I think I was secretly hoping for the powder to be packaged in biodegradable Easter Eggs or at least in four egg-shaped plastic pouches. The VeganEgg is made mostly from seaweed, nutritional yeast, and black salt. You merely whisk two tablespoons of VeganEgg with 1 cup of ice-cold water until blended (use an immersion blender if you want super-fluffy “eggs”) and then pour into a frying pan and cook over medium-high heat. Constantly scramble if you want scrambled eggs, or gently push and lift the eggs around the pan if you want an omelet. The VeganEgg does take slightly longer to cook than a regular egg, so plan to spend the recommended 6-8 minutes to make sure your eggs are done. 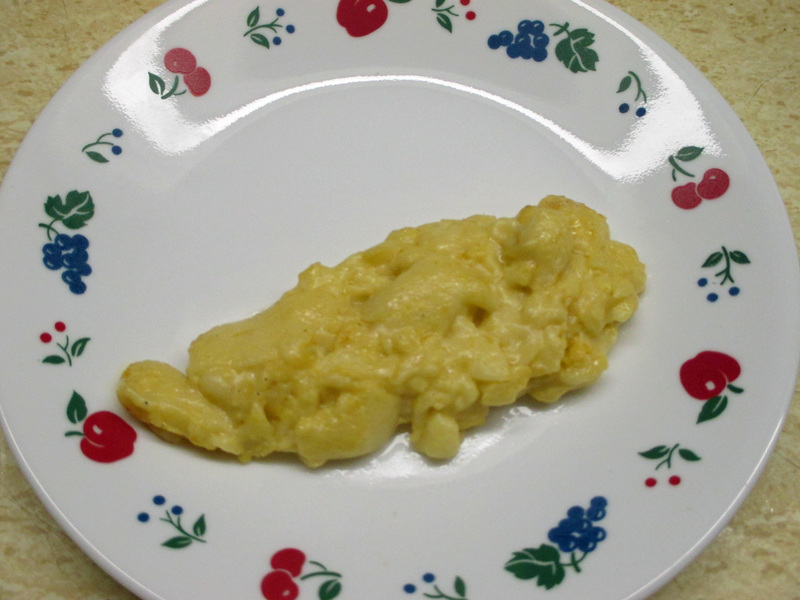 A plain scrambled VeganEgg. Freaky, eh? 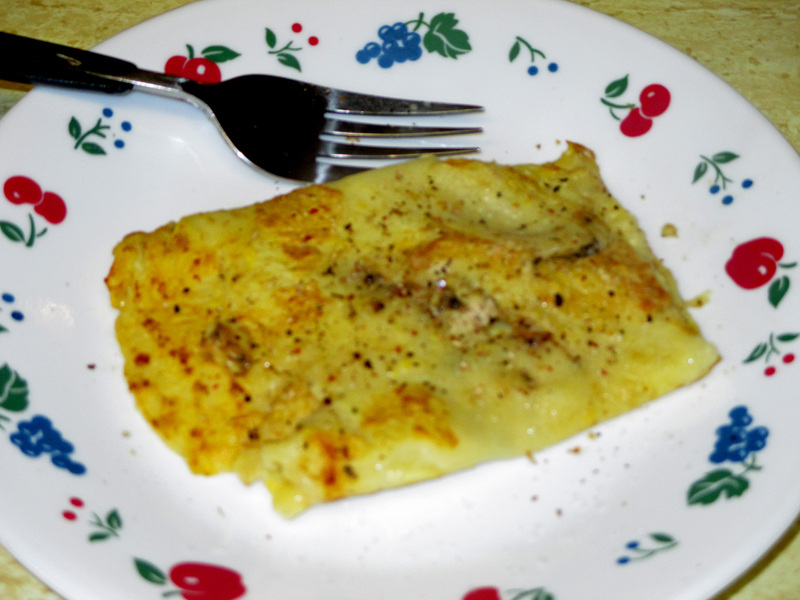 Next, my partner tried making a plain omelet. Again, appearance and texture was very close to a “real” omelet. Some freshly ground black pepper and extra kala namak made the taste very realistic, as well. 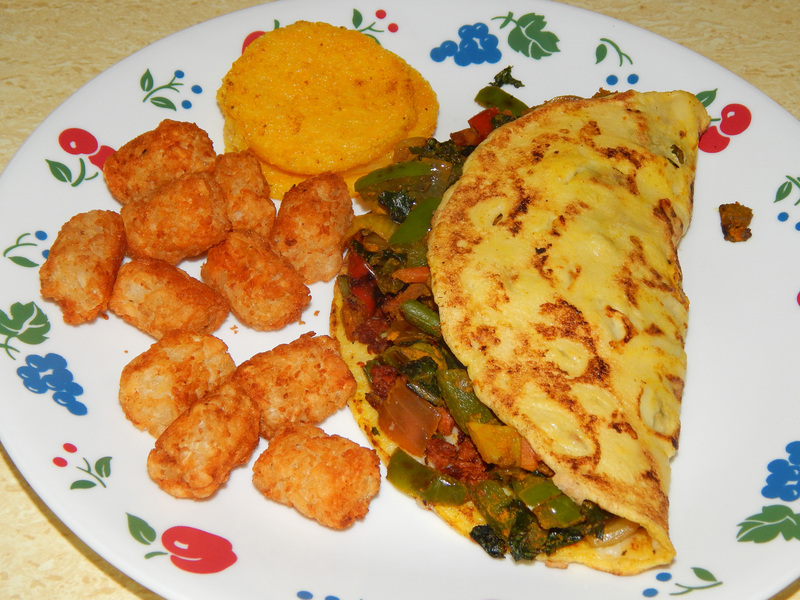 Encouraged, we then tried adding ingredients to our omelettes – and this is where the VeganEgg excels. This fluffy VeganEgg omelette with onions, green peppers, and a handful of Follow Your Heart vegan cheddar cheese was absolutely delicious! And finally, we experimented with crepes. While I had in mind more elegant ideas, such as strawberries or asparagus, my partner did his manly man thing and created a kind of overstuffed crepe tortilla filled with southwestern-flavored vegetables. Again, it was amazing. Anyone who has egg allergies – and especially people who have multiple allergies (for example, egg AND soy – which makes tofu scrambles unthinkable). Reducetarians and others who want to reduce their intake of animal foods and/or environmentally wasteful foods. New and transitioning vegans who are nostalgic for eggs and omelettes. Keep that VeganEgg batter moving! Whisk it well before pouring, and once poured, keep it moving in the pan! Key to fluffiness, not flatness! Follow the instructions and season to taste! Add black salt, freshly ground black pepper, herbs, and spices to your scrambled eggs. 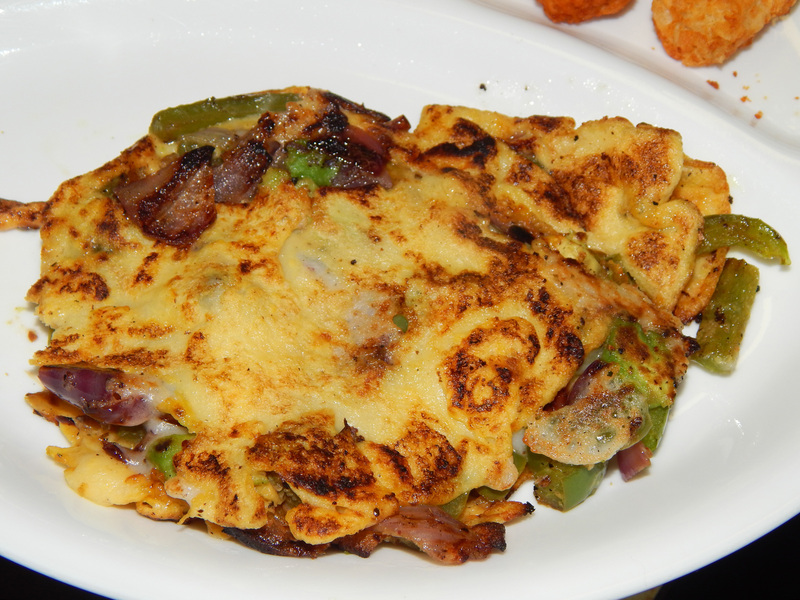 Add virtually any fresh vegetable to your omelettes. The one complaint I’ve heard about VeganEgg is, “it’s bland,” but seriously, folks, in your former omnivore life how often did you ever make an egg and not season it? In my case, never. I always added, at minimum, plenty of salt and pepper, and usually had jalapeno peppers, fresh tomatoes, and Tobasco sauce on the side to mix in. Final verdict? The VeganEgg is a game changer, and you owe it yourself (and the animals, and the environment) to give it a try. Have you tried the VeganEgg? 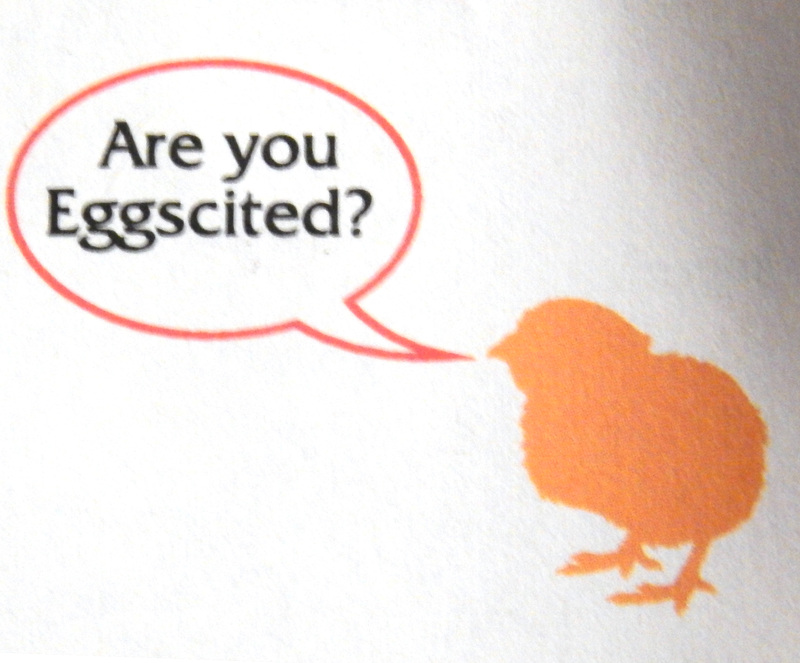 Are you Eggcited? Let me know! We really love our tofu scrambles, but we’re still looking forward to trying this when we find it locally. Husband is thinking he can bake with it too–any idea if it’s good for that? I’m glad you love this product, too! Let me know if you have found some great ways to use it. Hi Charlotte, You’ve done a great job on the Vegan Egg. On the next trip to Follow Your Heart, I’ll be putting a package of Vegan Egg in my basket for sure. Beautiful photos, too! Thank you for the great feedback, Zel! I hope you like the Vegan Egg, too! And need I say I’m a bit jealous that you live close enough to make a trip to Follow Your Heart? The cafe is on my vegan bucket list! I’ve not tried it yet but I’ve seen were a couple of people in a group I’m in on Facebook have tried it. So far, I don’t think too many folks are crazy about it. I shared your review with the group. Maybe the tips will help those who have tried or want to try it.